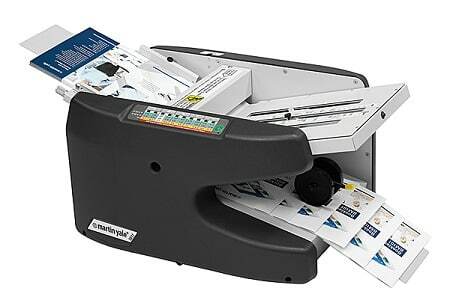 The Martin Yale 1812 Paper Folder is capable of feeding a wide range of paper weights without having to adjust feed system saving the operator time between folding jobs. It has fully enclosed fold tables making it quieter to operate and improved operator safety. Sheet sizes from 2.5” x 5.2” to 12” x 18” and weights 18 lb. bond to 90 lb. index can be folded. The feed table can hold a capacity up to 500 sheets of 8 1/2” x 11”, 20 lb. bond paper. It performs seven different fold types including: letter, half, z-fold, double parallel, gate, engineering (AKA short z-fold) and church fold that exit the machine on an easy access conveyor. Board controls provide multiple speeds plus auto shut off and jam detect. Max. Paper Size: 12" x 18" Min. Paper Size: 2.5" x 5.2"